What is new in the latest VSTSynthFont  version? 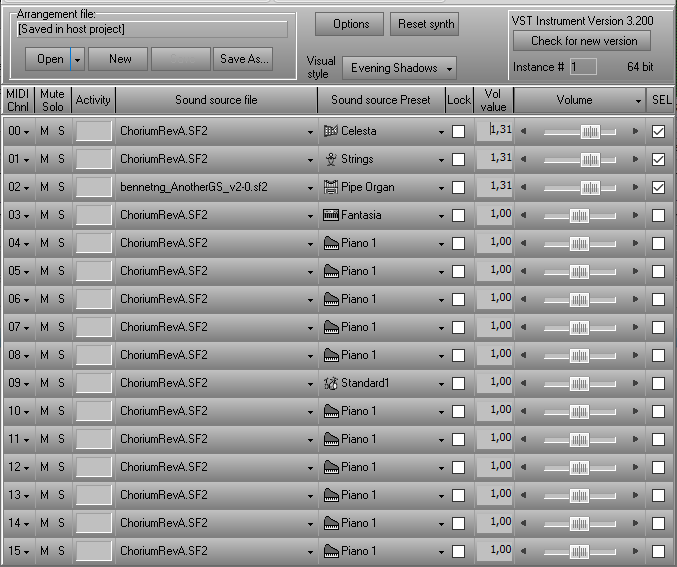 VSTSynthFont  is a complete rewrite of the older VSTSynthFont which is no longer supported. VSTSynthFont  has been extensively tested to make sure it is 100% compatible with common sequencer hosts like the Cubase range of products from Steinberg. NOTE 1: VSTSynthFont  is not freeware. You can try it for 15 days and then purchase a license for 15€. This license also covers SynthFont2, so you get 2 for 1! Go here to purchase a license by donating to help us continue developing this tool. NOTE 2: The name of the plugin is still VSTSynthFont or VSTSynthFont64 so that old projects can be used without any changes. What is new in version 3.200 of VSTSynthFont / VSTSynthFont64? - There has been no way to select multiple tracks for editing. This version has a new column at the far right with checkboxes. Here you can check the tracks you want to handle simultaneously. Additionally at the top there is a new button, "SEL". Press to select/unselect all tracks. See image at the bottom. - The 64 bit version has now a different "unique VST identification code" than the 32 bit version. Some hosts (like Cakewalk from BandLab) cannot handle two plugins with the same ID. If your host cannot find the 64 bit version you may need to rescan. - Generally optimized and faster 64 bit version than before. What is new in version 3.110 of VSTSynthFont / VSTSynthFont64? - Inbuilt Reverb effect: MVerb. In Options/Synth you must select the mode and also enable/disable the effect. You can adjust the amount by using the new item in the Mixer menu, "Reverb Amount". Additionally, the amount can be set by MIDI Continuous Controller #91 (effects level). What was new in version 3.100 of VSTSynthFont / VSTSynthFont64? 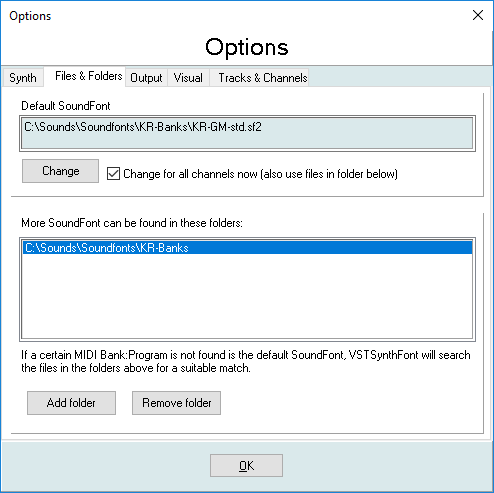 - You can now add more SoundFonts in addition to the Default SoundFont by listing folders containing any number of SoundFont files (or other suitable sound source files). See Options image below. Use this feature to add support for sound banks not present in the Default SoundFont. The plugin will search all the files for a suitable Bank and Preset patch. - GUI: Icons for the 16 MIDI Program groups. See image further down below. - GUI: The checkbox used for mute/play status has been replaced by a button (up/down status). Additionally, a separate Solo button has been added (see image). - GUI: The track function to choose Pitch Shifting mode has been moved into the "Mixer" together with functions like Volume, Pan etc. - GUI: The height of the tracks has been increased to facilitate text on two rows (mainly Sound source file and Preset). - The plugin can now automatically check for the availability of a new version (there is also a button for manual check).